At Silverman Opticians in London our optometrists can provide advice on conjunctivitis management and treatment. The white part of your eye and the inner surfaces of your eyelids are covered by a transparent membrane (thin layer of cells) known as the conjunctiva. If the conjunctiva becomes inflamed, you have a condition called conjunctivitis. There are three types of conjunctivitis: irritant, allergic and infective. Each type of conjunctivitis is caused by different factors. Infective conjunctivitis can be caused by a virus, bacteria or, in rare cases, by a sexually transmitted infection such as chlamydia or gonorrhoea. The most common symptoms include reddening and watering of the eyes. You may also notice a sticky coating on your eyelashes, particularly when you first wake in the morning, which can make your eyes feel like they’re stuck together. Infective conjunctivitis is a very common condition and is responsible for 35% of all eye-related problems recorded in GP surgeries. It is most common in children and the elderly. Infective conjunctivitis rarely requires any medical treatment because the infection will normally heal by itself, usually within one or two weeks. For most people, the condition does not cause any complications. Those most at risk of developing complications from infective conjunctivitis are newborn babies, who are 28 days old or younger. An infection in the eye at a very young age can cause permanent damage. If you have infective conjunctivitis that is caused by a sexually transmitted infection (STI), your condition may last several months, rather than weeks. 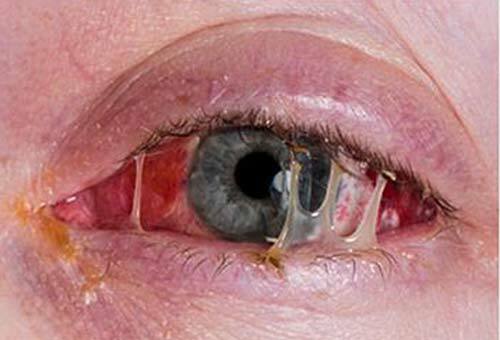 Irritant conjunctivitis occurs when an irritant such as chlorine or an eyelash gets into your eyes. This can make your eyes sore and if you rub them it can irritate them more. Avoiding the irritant and not rubbing your eyes will help. However, if your eyes are very red and painful, you should seek medical help immediately. Allergic conjunctivitis occurs when your eye comes into contact with an ‘allergen’. An allergen is a particular substance that makes your body’s immune system react abnormally, causing irritation and inflammation in the affected body part. The most common form of ocular allergy arises from pollen, with hay fever now affecting more than 25% of the UK population. Try to avoid exposure to pollen, staying indoors and refraining from parks and gardens when the pollen count is high (the Met office publishes a 5 day forecast). Wrap around glasses or sunglasses can help prevent pollen from entering your eyes. If you are exposed, then remove the pollen as quickly as possible by washing your hands, face and hair. Unpreserved lubricating eye drops such as Lubristil can help to wash it out of your eyes. Try to avoid rubbing your eyes as it can make things worse and don’t wear contact lenses or eye make up. Cold compresses such as refrigerated eye lid masks, ice packs or slices of cold cucumber can help to alleviate symptoms. Antihistamine eye drops such as Otrivine, or mast cell stabilisers (preventing the histamine response) such as Sodium Cromoglicate are available from pharmacists without prescription. They should ideally be unpreserved in individual vials because the preservatives used in multi-dose bottles can themselves cause inflammation. There is evidence that steroid based nasal sprays (also available from pharmacists) can give relief to red itchy eyes and there are numerous antihistamine tablets to help with the general symptoms of hay fever. It is extremely important to seek advice from the pharmacist, before using any of these medicines, because each formulation has different pros and cons and they may interact with other medication. If one or both eyes remain red or sore in the absence of hay fever symptoms then you should see your eye care practitioner or if you are unable to manage your hay fever symptoms then see your GP.